The Superstar Classic represents decent value for money, offering punchy tones to the drummer on a budget. Snare is a solid performer. Excellent tone from the toms. Bass drum can be a little boxy. In 1976, two years after the first Imperialstar and Royalstar kits were released under the Tama name, the Superstar 9600 Series was born. Following a revamp in 2005 and a Hyper-Drive variation three years later, 2018 signals the return of this Tama staple in the form of the entry-range, all-maple Superstar Classic Maple. At present there is only one five-piece fusion-size shell pack, featured here, which consists of a 22"x16" bass drum, 10"x7" and 12"x8" rack toms, a 16"x14" floor tom and 14"x6½" snare drum. The kit comes in just three lacquer finishes - Blue Lacquer Burst (as pictured), Coffee Fade and Tangerine Lacquer Burst. The Blue Burst of our review kit leans more toward a turquoise colour with strong elements of green showing through, particularly in the faded central section. The light coating of paint and the natural maple woodgrain adds an attractive swirling texture to the overall finish. These darker tones toward the edges are complemented well by the black wooden hoops of the bass drum. Conversely, the bass drum hoops on the Coffee Fade and Tangerine Lacquer Burst kits match the paint jobs of their respective kits. Triple-flanged chrome hoops come as standard on toms and snares. The Superstar Classic shells are 100 percent maple which, for this price range, isn’t as regular an occurrence as you might expect. The new, lightweight shells use a thin 6-ply (5mm) construction for the toms and snare, and 8-ply (7mm) for the bass drum. Shells are of a decent build quality and feature classic 45° bearing edges with back cuts. The diagonal joins are finished well although they are visible both inside and out. With a classy nod to the kit’s ’70s origins, each Superstar Classic drum proudly sports the original T-shape Tama badge. The badge also neatly incorporates an air vent. While the 14"x6½" snare drum features Tama’s original dual Superstar lugs, the kick drum and toms use a newly designed low-mass single lug (12 for the rack toms, and 16 for the floor tom and bass drum), which is a first for the Superstar series. These small rubber-lined nut-boxes are not the most elegant we’ve seen, but are perfectly functional. Tama suggests that by reducing the surface area that the lugs occupy on the shell, there is less hindrance of shell resonance. Additionally, using considerably less material to produce these new lugs reduces manufacturing costs which results in a much more affordable kit. The bass drum is drilled to allow for Tama’s Omni-Ball dual tom holder (MTH600), a sturdy system that can also be found on Imperialstar kits. 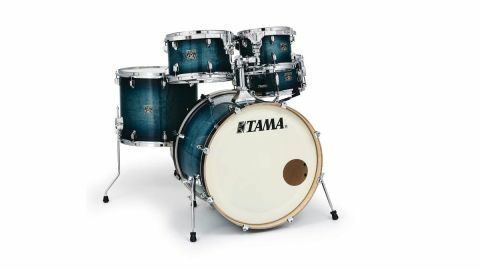 The 10" and 12" rack toms use Tama’s familiar RIMS-style Star-Mount system, which connects to four of the drum’s tension rods and runs halfway around the shell’s circumference. The large mounting brackets mean that the toms can’t be positioned right next to each other, but their straight edges permit more wiggle room than if they were curved. The four-point connection ensures ample support - there’s some movement when the toms are struck, but it never feels unstable. When positioning the toms the ball joints have a smooth action and the drums stay exactly where we set them, even after several hours of playing. As an optional add-on, Tama recommends the Stagemaster hardware kit which can be purchased for £199. The pack represents an extremely affordable companion to the Superstar shell pack and includes two boom stands, a hi-hat stand, snare drum stand and an Iron Cobra 200 single bass drum pedal. A snare drum can make or break the overall playability of a drum kit and, as is often the case with kits closer to entry-level, the snare drum tends to be the weakest link in terms of tone, tuning range and even the supplied hardware. From throw-offs to snare beds, there’s just a whole lot that must go into crafting a decent snare drum - particularly tricky when trying to mass-manufacture a kit on a budget. The great news is that the supplied 14"x6½" Superstar snare does not fall into this common trap. Despite the unsophisticated hardware and overall look, it’s responsive and musical with a warmth that shines through at medium to high tunings. The extra depth (compared with the standard 5½") affords it a fuller and broader tone, which also makes it more versatile. Tuned up to a tight crack, the drum is punchy and lively with warm overtones. With a little dampening the snare offers a more controlled attack which would be as happy in rock styles as it would be playing funk or fusion. Despite sounding like it could go higher, at this point the tension rods feel close to breaking point so we decide to leave it there. The 10"x7" and 12"x8" rack toms tune up easily and have just as much punch as the snare. With the supplied Power Craft II double-ply heads, the drums conjure an instant attack which works well at low tunings, particularly for heavier styles. Tuned up the toms are well focussed yet offer a decent sustain and sing harmoniously with each other - they would certainly be well-suited to gospel, funk and r’n’b styles. Heading for the floor tom, we discover that it works best at a really low tuning where you can draw out some low-end. There seems to be more bark than bite with this drum. It responds quickly but lacks low-end muscle, offering more tone from the head rather than drawing on the full size of the drum. Taking stock for a moment we have to remind ourselves that this entire kit comes in at just £699, which offers some perspective while tinkering with the tuning. We do eventually find a sweet spot but can’t help wondering what a 14"x14" tom might sound like in its place. The bass drum seems to suffer from the same problem and, despite a punchy attack, doesn’t seem to be accompanied by the thunderous bottom-end we were hoping for. Wide open the drum is a little boxy and the addition of a bass drum pillow dries it out more than expected. Despite being less than cooperative, we reckon that with some patience and the correct combination of heads and a small EQ pillow, this bass drum has the potential to match the musicality of the toms and snare. Overall the kit performs remarkably well, looks and sounds the part, and feels great to play. What more could you want for the price? In fact, one might be forgiven for assuming that the Superstar Classic comes in at a higher price than its affordable £699 price tag. Its versatility and musicality makes it an ideal choice for the beginner to intermediate player looking for their first ‘proper kit’. It also makes a decent lightweight gigging kit which could also be suitable for more experienced players.